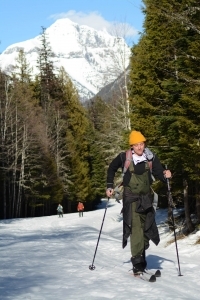 Experience cross-country skiing Glacier National Park in the peaceful quiet of winter. Let us take you for a glide over the snow-covered landscape and see a place most people only imagine. Our touring areas abound with frozen waterfalls, huge snowy peaks and ice-capped streams. See occasional wildlife and get some fresh air on a private cross-country ski tour. We offer full cross-country ski rentals out of our office. Tours will generally lead to a scenic lunch spot, followed by hot drinks and group photos. Our guides are fully trained in preventing and treating cold-related injuries, and will keep you and your group out of harm’s way. Day trips: Meet at the Glacier Adventure Guides office at 9 a.m., where we will drive to the trailhead in Glacier National Park to begin the day. We also offer a shuttle service to pick guests up from their lodging at 9 a.m. Full day ski tour, return to Columbia Falls before 5 p.m.
*Izaak Walton Inn Guests: Meet downstairs at the guide kiosk at 9 a.m. Load up and head to the trail, full day ski tour in Glacier National Park, return to the Inn around 4 p.m.
Glacier Adventure Guides leads cross-country ski tours to the west and east sides of Glacier National Park, depending on conditions. Many of our tours are highly flexible and great for any age or fitness level. from the shores of Lake McDonald. Tour the west shore of Lake McDonald on a ski to Fish Creek. This tour leads you past the historic shareholdings and cabins of Lake McDonald, out to the Camas Road and on to Fish Creek. Skiers have the option to continue from Fish Creek campground out to Rocky Point, one of the most scenic spots on Lake McDonald. Our most popular cross-country ski tour. Tour the across the old bridge and McDonald Creek, have lunch by the roaring waters of the Sacred Dancing Cascade, and finish the day with a pleasant cruise back on the Sun highway. Easy access and mellow terrain make this an ideal family outing. the foot of Avalanche Lake. When conditions allow, winter can be an excellent opportunity to ski to Avalanche Campground and up to the Lake. After a six mile ski, skiers will then ski or walk up the Avalanche trail, past the ice-filled gorge and up the stream to the basin. Views of Monument Falls and the Little Matterhorn are postcard-worthy. While this is the longest ski tour we offer, it is easily done in a day by those fit enough. Autumn Creek at Marias Pass. For cloudy or stormy days on the Park’s west side, this is your best option to see the sun. While windy, Autumn Creek and Marias Pass have many more sunny days during the winter. Easy touring across rolling, wind-scoured terrain make this a popular tour. Skiers will pass through lodgepole pine forests and trek the foothills below Glacier’s massive front range. From these slopes are big views of the great plains and nearby peaks. Flexible tour options and good weather make this an excellent group destination. The town is also a short drive from the North Fork of the Flathead River, and is surrounded by the Whitefish, Livingston and Swan mountain ranges and several national and state forests. “C-Falls” is a prime destination for skiing, hiking and camping. Adventure lives here!